Travelers often consider the “must-see” attractions, but neglect the “must-hear.” In this series, Sounds of the Southeast, we bring you the noise that can be heard across the Southeast in cities known for their rich, musical culture. Athens, Georgia, has given the world bands like R.E.M. and Widespread Panic. Today, the noise coming from the bars, restaurants and concert halls of this college town remain an important part of the city’s personality; it is where gritty Indie rock meets alternative pop with a smile and a “welcome home.” Athens changes with the rush of students that come each fall—bars become different bars, coffee shops turn into hair salons—but its distinct sound always invites folks back to listen and remember. Below, find your mandatory homecoming spots for your next music Odyssey in the Classic City. The Georgia Theatre has seen some of the biggest names in music. John Mayer filmed his music video for “No Such Thing” just below the famous red-lettered marquee. The Alabama Shakes, Childish Gambino, and Cherub have all graced its stage. However, before it became the thriving venue it is today, it served as the Athens YMCA, a movie house, a Masonic Temple, a church, and, at one point, a furniture company. In 1935, the venue turned into theatre. In 2009, the building withstood a devastating fire, but was built again by a determined community of music lovers. Through it all, the Georgia Theatre continues to host performers and crowds—on its legendary indoor stage or on the recently added rooftop bar overlooking downtown Athens. 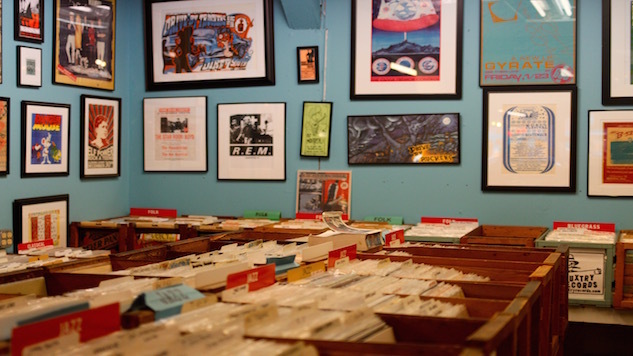 Wuxtry Records has been on the corner of College Avenue and E. Clayton Street since 1976, when Dan Wall and Mark Methe opened the iconic shop. With time, it expanded—like the best spots do. Today, the original corner location is part of Wuxtry’s budget locale and the larger space next door (once a drug store) has been converted into a Mecca for all things vinyl. The first racks visible upon walking in the store are the newest releases and staff picks—take them at their word. Employees Mike Turner, owner of the record label Happy Happy BTM (Birthday to Me), and John Fernandes, owner of Cloud Recordings, display their most recent sounds, and they do not disappoint. Behind the counter, there is someone willing and ready to make any suggestions, whether it is 1990s Indie pop or the alternative rock sound of Neutral Milk Hotel (a consistent seller). Also, consider venturing to their upstairs store, Bazarro Wuxtry: Comics, Toys & Stuff. Once a gas station, today Hendershot’s is a coffee shop, eatery, bar, and venue that reverberates small-stage ambiance, which changes based on the act. Mellow acoustic gives way to steady rock and the inventive of sounds of groups like the Gypsy Wildcats and The Go Rounds. Mondays are open-mic nights. Before heading to town, sign up on Facebook. The Foundry takes its name from the days when it served as an iron foundry and the venue still embodies craftsmanship both in its music and on its food menu. Exposed brick walls and high-beam ceilings frame this space and are offset by modern furnishings. Since opening as a music venue, the Foundry has hosted a number of nationally renowned bands from genres such as bluegrass, folk and jazz, but the stage is a great place to catch emerging artists as well. Chef Kyle Kilgo works to match the local tunes heard on stage with a menu that reflects the Foundry’s heritage, sourcing its ingredients locally as often as possible and bringing guests comfort foods. Going to Caledonia is like going to your favorite basement party—complete with strings of random Christmas lights—every night. Located in the parking lot just behind the 40 Watt Club, consider it a rite of passage to get lost finding the entrance (it is located on the side of the building). Emerging artists call Caledonia home, and locals call it their favorite hole-in-the-wall. Caledonia consistently hosts local artists like The Good Looks, BIT BRIGADE, and Jet Engine Dragons. If you’re searching for the newest sounds out of Athens, search no further—they’re at Caledonia. Grace Williamson is a freelance writer based in Athens, Georgia.